All organizations are challenged by file sharing and document storage issues. The struggles range from storing data and documents so they don’t get lost to streamlining collaboration of multiple staff on a single document. “Explore the Empowering Solutions of Microsoft SharePoint” is an excellent white to help you to address these time-draining challenges and more for your company. 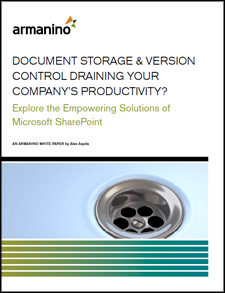 Written by Alex Aquila, a SharePoint consultant with many years of experience, this white paper explores the software’s functionality – features and benefits you may never have known are available. How can I control who accesses certain documents? I need some documents approved before they are sent to clients…how do I make that happen? How do I track revisions on my documents? What steps do I need to take to create a centralized location to track and manage customer projects and documents? What’s the best way to implement a document sharing system that is viable across the country or with our international subsidiaries? Armanino is a 2012 Microsoft Dynamics Inner Circle partner with deep ERP, CRM, SharePoint and Office 365 capabilities.